Quinoa is very rich in calcium, protein and being a complex carbohydrate makes this food a natural internal cleanser. This makes quinoa part of a good plant based calcium diet for vegans as well as those who are lactose intolerant. For detailed nutrition and health benefits please visit whfoods. We recommend iron skillet instead of the non-stick tava/skillet. One skillet that has served me well is, Lodge Iron Skillet. Soak the quinoa for about 4 to 5 hours. Then, wash it well and drain the water. Now, put this quinoa, half cup of water, and green chilies to the mixer and grind it to a thin paste. Transfer the batter to a bowl and add cumin, chopped onions, salt, and cilantro. 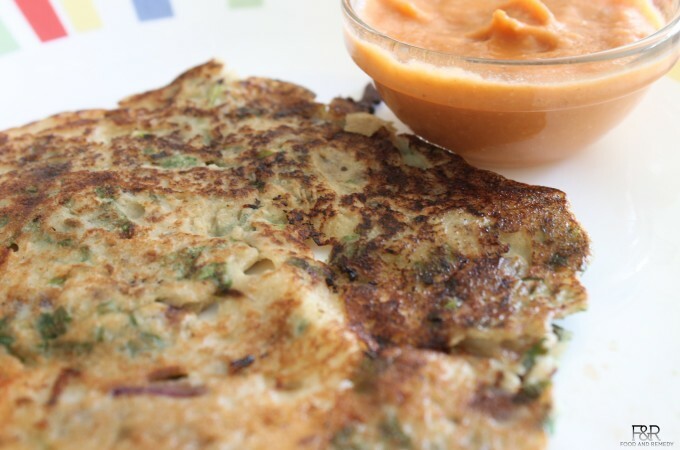 Mix it well and make it into a batter (pancake or dosa batter consistency). Now the batter is ready and you can use it right away, or you can store it in the refrigerator. To make dosa, heat the iron skillet on medium high heat. Once the skillet is hot reduce the heat to medium. Pour the batter onto the middle and spread it around into a nice, flat round shape. Add a tsp of oil around it, and cook for 1 to 2 minutes. Flip the dosa to cook on the other side too. It should be a golden brown color on both sides. The quinoa dosa is ready. It tastes best when it is hot. Eat with chutney or any of your favorite side dishes and enjoy! Please provide your comments or suggestions for the Quinoa Dosa preparation. Please try Moong Dal, Methi, Quinoa Dosa, (recommended and suggested by our Ayurvedic advisors), which balances both Vata and Pitta aggravations.